If you’re thinking about starting a business, then I would define you as an ‘Apprentice Entrepreneur’. You’re in very good company – we reckon at least half the people in the UK have a general desire to start their own business, with an even higher percentage amongst young people. The good news is, starting a business is not rocket science (unless you plan to design and sell actual space rockets). I spend most of my time de-mystifying the process for people. 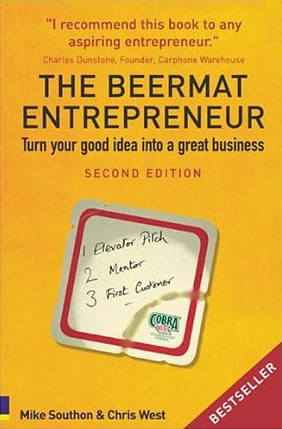 You might want to invest in a copy of our book The Beermat Entrepreneur. It’s also in most public and University libraries. It’s a complete myth that you need to quit your job, write a business plan, raise money, register your business at Companies House, take out patents or even open a bank account at this stage. Our model is that you first go down to the pub (or restaurant or coffee shop or anywhere social) with a couple of friends and write on a Beermat (or coaster, or napkin, or notepad). Ideally, there should be three people around the table. None of them are full-time at this point – you’re just kicking ideas around. One should be passionate about delivering a service or product (Delivery); one should be good at charming money out of people (Sales), and the third should be good with money and knows how to handle a spreadsheet (Finance). The People who would be involved in your enterprise: yourself and anyone else in your team, even if working part-time. Make sure you cover all three bases: Delivery, Sales and Finance. Your Purpose – First, how are you going to make a profit, and second, how will your enterprise make the world a better place. Second, it’s great if you can define your social purpose, even if initially it is just to provide for your family and increase the number of Linux experts or well-groomed dogs in your neighborhood. 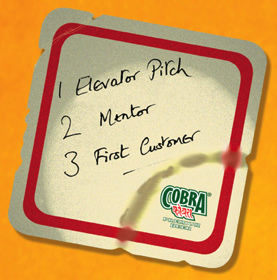 Once you’ve worked out your Elevator Pitch, you can approach any number of mentors for free advice. This could be a family friend, someone who taught you at school, or a former college you previously worked with. If they like you, they’ll give you invaluable free advice about your business, and might even help you find your first customer. The first customer is the hardest, which is why I always recommend you try and sell to your friends first – if your friends won’t buy from you, strangers are even less likely. ‘Friend’ is a broad term; it includes your family, close friends, or anyone who you worked with previously who likes you. Ideally this is a job for your ‘Sales Cornerstone’ who should always start by offering a service rather than a product. If you are planning to invent a better mousetrap (which will eventually require development and patent costs), try selling ‘rodent suppression’ consultancy first. For your first sales, try and keep the amount of service you’re offering as low as possible, such as a few days’ work. It’s easier for people to make small decisions on an unproven concept and supplier. Delivery: did you enjoy the process and want to do more? Sales: are more people (friends of friends) interested in placing orders? Finance: does your spreadsheet say that you can scale the enterprise profitably? If the answer to all these tree questions is ‘yes’, then congratulations, you’re an entrepreneur! The rest is detail: opening a bank account, formally starting the business etc. You can deal with all that stuff later, ideally paying someone else to help you deal with the tiresome bureaucracy, probably your Finance colleague. The other two should concentrate on Sales and Delivery, in that order. As you have actually secured some profitable revenue, in our model, you are now a ‘Seedling’ and can look at the next stage. If you’re still pre-revenue, you might find my freebies and blogs useful.